Learn how it works and how you can benefit from it! Appliance breakdown takes the electricity data from your meter and your appliance profile to pinpoint the usage of individual appliances. 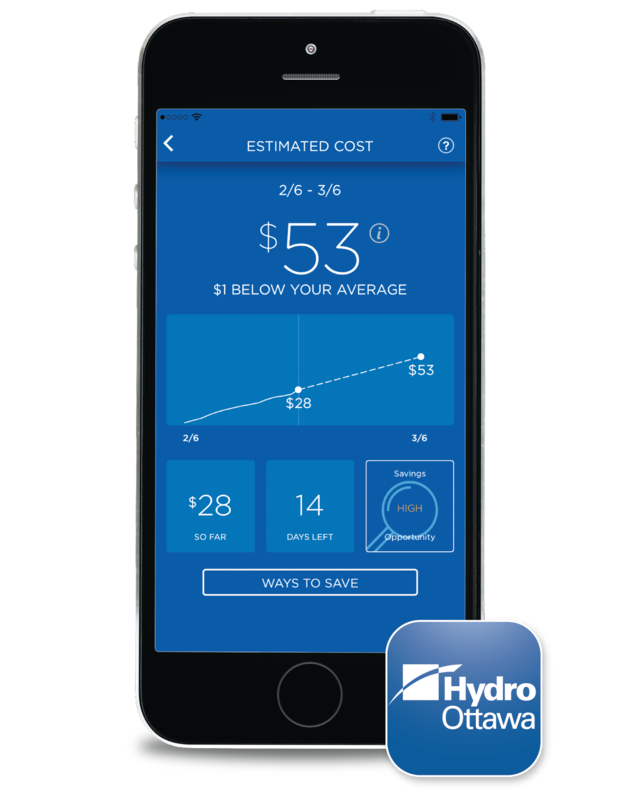 This information is available through the Hydro Ottawa app for iOS and Android. Each appliance uses electricity in a unique manner - think of it like an appliance fingerprint. We detect and extract these “fingerprints” and convert the data into useful insights and recommendations. What if my usage changes? Don’t worry. The insights we derive from each appliance in your home will change according to your actual usage patterns. So whether you go on vacation, or buy a new appliance, we’ll make sure you’ve got the most accurate and relevant appliance usage information at your fingertips. It sure is! Appliance breakdown shows how much you actually use per appliance, not how much a "typical" home should use. You're not a statistic; we won't treat you like one. We itemize your usage into 12 major appliance categories. You can track the usage of every single category over the course of the year and see how they change based on season, weather and your behaviour. We display categories that consume a large amount of electricity, like ‘Always On’, heating, cooling and pool pump, based on the usage from your meter. We then take this usage to infer and estimate how much your other appliance categories, like laundry, cooking, lighting and entertainment, are consuming. Through a combination of your actual usage and our rule-based model, we can compose a holistic picture of your total electricity consumption. Within the Hydro Ottawa app for iOS or Android select “Appliance Profile” from the main menu in the upper left corner. Log in to hydroottawa.com/account, select Usage, then ‘Profile to access “Appliance Profile”. ‘Always On’ includes "plugged-in" devices such as personal computers, monitors, printers, stereos, and televisions that consume electricity even when they’re turned off. Learn more about ‘Always On’ power and get energy saving tips. Pool pumps have motors that keep your pool water filtered and clean. Note that pool pump only shows up with an updated appliance profile. Furnace includes the electric fan component of gas heating and many different types of heaters: radiant, convection, fan, storage, underfloor, and heat pumps. This includes common cooling appliances such as central air conditioners, room air conditioners, heat pumps, and mini-split air conditioners. This includes all the lights in the home, from efficient LED bulbs to inefficient halogen bulbs and everything in between. Refrigeration includes the aggregate usage of refrigerators and freezers in the home. Electric water heating includes all whole-home water heaters (tanked, tankless/instantaneous, and heat pumps) as well as specific-use water heaters. Hot tubs are also included in this category. This category includes the aggregate usage of all EVs at the home. EV only shows up with an updated appliance profile. Cooking and food preparation appliances that consume significant amounts of electricity can be found in this category, including oven, stove top, toaster, and toaster oven. Laundry consists of “wet washing” appliances, such as dishwasher, washing machine, and dryer. Entertainment is comprised of two main types of appliances: consumer electronics (TV, PVR, game console, stereo) and home computing (desktop, monitor, printer, modem). These are appliances that are too small, or too infrequently used to be categorized separately. This includes mobile phones, vacuum cleaners, fans, hair dryers, and curling irons.